Join VCS for a great family event and annual tradition. This year we expect to clean over 20 of our beaches -- look for a complete list on our website soon! If you would like to volunteer, please give us a call at the office (508-693-9588), or email. Tuesday, March 25, 7:00 pm, Vineyard Haven Library. Saturday, March 29 from 10:00 am to 2:00 pm, West Tisbury. The last Seaside Saturday of the season! The Long Point Visitor Center opens their doors for a variety of free self-guided educational programs for kids and families. A TTOR educator will be available to answer questions and help your family get started. See flyer for details, or email for more info on the program. Sunday, March 30, 1:00 to 3:00 pm, Signal Hill in Chilmark. Join The Trustees of Reservations for a guided hike at one of their conservation-restricted properties between Menemsha Pond and Squibnocket Pond. $10 (free for members), reservations are required. Call (508) 693-7662 to register and for more info. Sunday, April 6, 1:00 to 3:00 pm, Wasque (Chappy). TTOR hosts a presentation and educational walk at Wasque, focusing on the history and science of the breach and the rapid erosion at the cliffs. $10 ($5 for members), call (508) 693-7662 or see website for more info. With five of the seven existing species of sea turtle now listed as endangered or critically endangered (and the other two not doing much better), one might presume that short supply would make this delicacy unaffordable for a family on a budget. Or, perhaps just something reserved for special occasions. Au contraire! In fact, in recent decades demand for sea turtle meat has also collapsed, thanks to legions of sanctimonious reptile huggers and their fellow travelers. (Why, the VCS has even used their threatened status to promote, of all things, a beach clean-up!) Clearly, basic economics argues that sea turtle steaks remain as reasonable a choice as ever. Proper preparation of a sea turtle steak, as with most endangered species, has become a lost art. 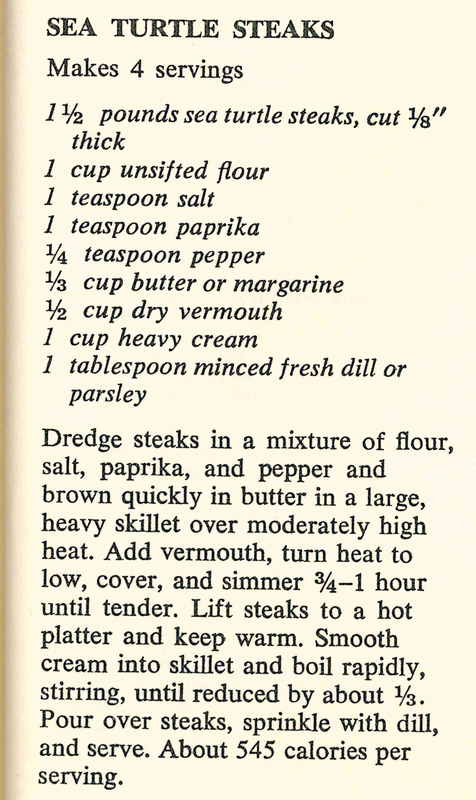 Thankfully, we have the Doubleday Cookbook (Complete Contemporary Cooking, Vol. 1) when we need a classic recipe. Also, for those seeking a fun family outing (or just wish to economize), you can try harvesting your own sea turtle. Here too, the Doubleday Cookbook comes to the rescue! (Warning, not for the faint of heart.) But remember, they are endangered, so you'll need to look carefully. Ed Note: The Endangered Species Act was passed in 1973, providing legal protection for sea turtles. 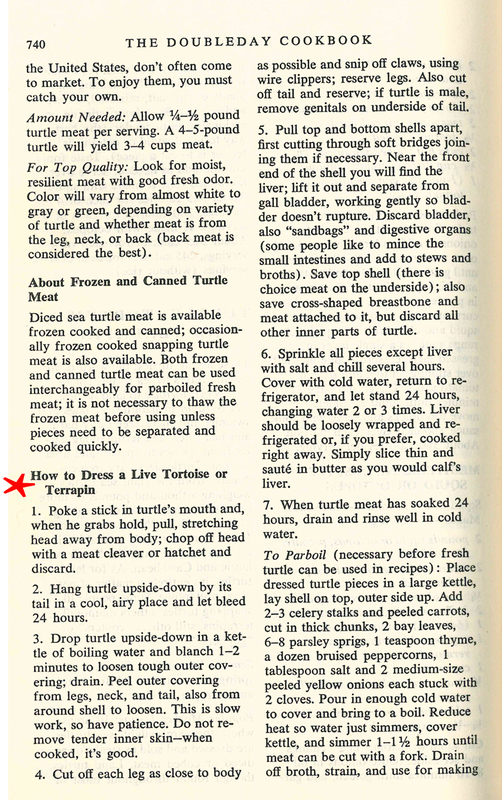 The Doubleday Cookbook, copyright 1975, states that the "choicest" and "most readily available" species is the green sea turtle. It would appear this cookbook was already a bit “old-fashioned” at printing. I wonder what other endangered species we might find in there! 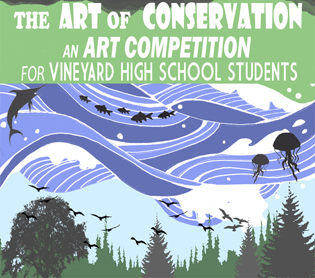 All Island high school students are invited to share their thoughts about these questions through their paintings, drawings, photographs or sculptures. Selected submissions will be exhibited at Island venues, and . . .
Beachgrass, Ammophila breviligulata (left) is an important part of the native beach ecosystem, helping to stabilize dunes. The invasive spotted knapweed, Centaurea maculosa (right) is similarly a pioneer species, readily colonizing newly created growing sites. But the similarity ends there; where beachgrass pioneers to support a native ecosystem, spotted knapweed arrives to conquer. The Dukes County and Friends of Sengekontacket Barrier Beach Task Force is seeking volunteers for a project aimed at improving the plant life at Joseph Sylvia State Beach. On Saturday, March 29 (rain date March 30) they will be working to remove spotted knapweed, a persistent invasive species, and plant new beach grass. Volunteers please meet at 10:00 am on the beach at the path closest to the Big Bridge on the Oak Bluffs side (Pathway 22). Bring work gloves, a trowel or garden spade, and sun protection. For additional information, contact Greg Palermo by email or at (908) 403-0721. The MV Commission hosts a public hearing this Thursday, March 27 at 7:00 pm to hear testimony regarding new fertilizer regulations. In a effort to reduce nutrient pollution in our waterways, a recent state law will enact new restrictions on the sale and use of fertilizers. However, due to our unique coastal ecology, the Cape and Islands have been given a narrow window to create our own rules, locally tailored to more closely match our environmental concerns. One of the most important of these concerns is that the primary nutrient problem in our coastal waters is nitrogen, but the emphasis of the state law is phosphorus. This Thursday's hearing is crucial because time is short: to avoid defaulting to the state regulations, and therefore miss an excellent opportunity to improve the water quality in our estuaries, our local regulations must approved at this April's town meetings. Come share your voice and help fight for strong protection of Island waters! Was 2013 Warmer than 2012? After a harsh (and seemingly endless) winter, complete with snow in the forecast for Wednesday, it may be hard to believe that, globally, 2013 was in fact the 6th warmest year on record. That's the announcement today from the World Meteorological Organization, as reported by Climate Central. Clearly, there can be large differences in yearly weather across regions of the globe: for example, 2012 was the warmest year on record in the 48 contiguous U.S. states, but only the 10th warmest globally. Given that 2013 featured extreme heat throughout much of the southern hemisphere (especially Australia), and a bitterly cold winter in much of the U.S., we might expect something of a reversal in the rankings. Unfortunately, the graph (above) that Climate Central created to accompany their story is somewhat similar to that used in their 2012 story, a confusing mess that prompted last year's "Worst Almanac Entry on Record." Where the 2012 graph seems deliberately misleading, though, this year's is mostly just confusing. In contrast, this image (from NOAA) gets the point across clearly, with the years in order from left-to-right and no funny business with optical illusions. 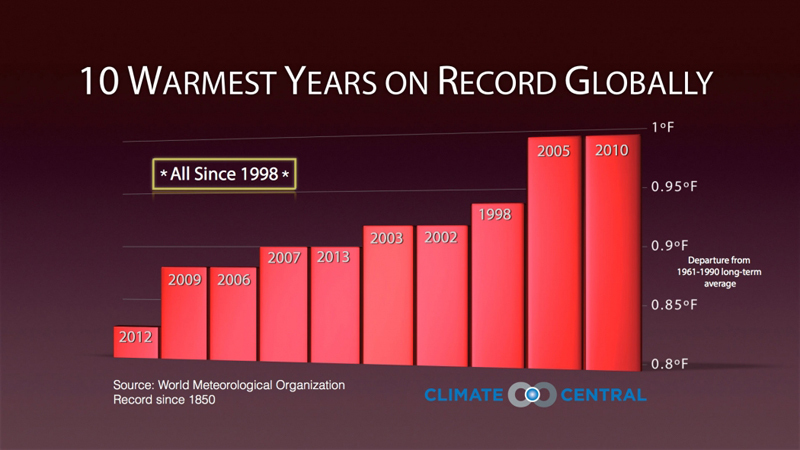 Looking across decades, the planet is clearly warming, and there is no evidence of a slowdown. When the facts are on your side, you don't need to confuse or exaggerate!